In this quick review, we will be looking at Bitsgap a relatively new crypto platform that went live in February 2018. 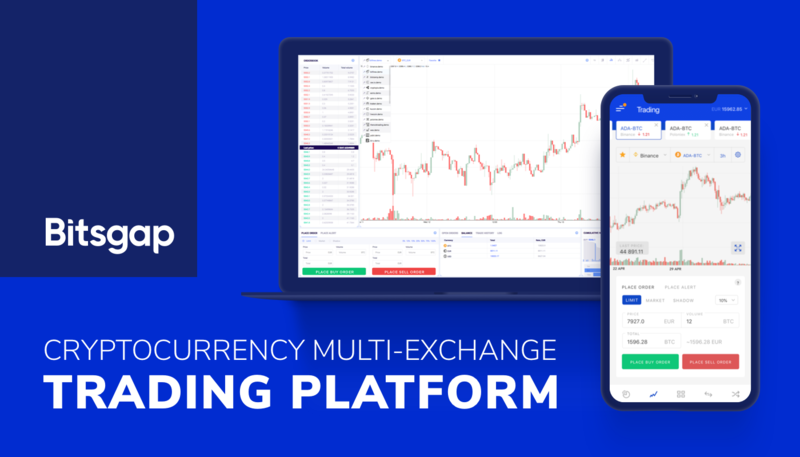 Bitsgap connects you to different cryptocurrency exchanges and from its unified interface, you can carry out all the various functions that these exchanges offer such as trading, charting, and portfolio management. In this sense, it is similar to Totle, which performs a similar aggregation service for the various decentralized exchanges on the market. However, while Totle focuses on decentralized exchanges, Bitsgap has both centralized ones and decentralized too. Also, a key selling point is that Bitsgap allows instant exploitation of arbitrage opportunities, something not offered by Totle. At the time of this writing, Bitsgap can connect you to a total of 31 different exchanges. This list is prominently displayed on the front page of their website. According to words of platform founder amount of exchanges is not final and will increase. After creating an account on Bitsgap and signing in, you will be brought to this page. Unlike Totle, which automatically connects to the various decentralized exchanges, for Bitsgap, you will need to use an API key to connect to the centralized exchanges. Due to the nature of centralized exchanges, it is impossible for Bitsgap to be able to connect automatically to centralized exchanges the way Totle does to decentralized ones. Nevertheless, your funds still securely remain on the respective exchanges. 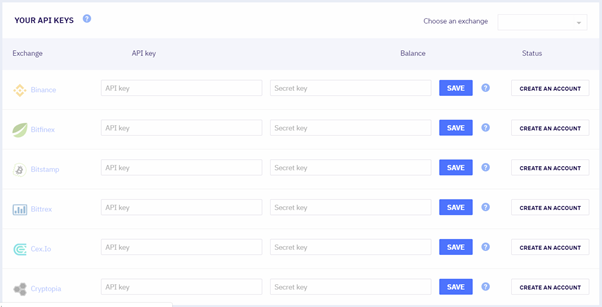 As an additional security layer, the platform accepts only keys with the withdrawal option turned off. Clicking on the ‘My Exchanges’ tab on the menu bar brings you to the following page which lists out the supported exchanges and entry fields for their respective API keys. 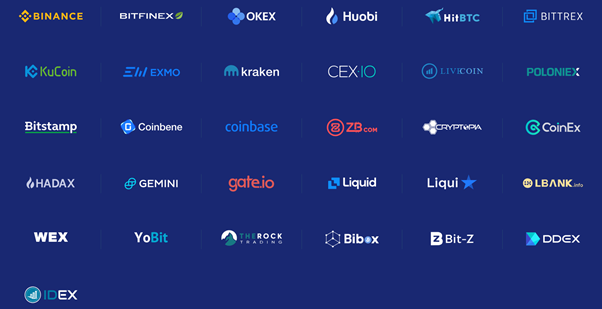 The downside of this is that if you want to use Bitsgap to trade from 31 different supported exchanges, you would need to set up accounts on all 31 exchanges prior to using Bitsgap. Again, while this was likely the only way Bitsgap could have set it up, it does not make it the most convenient thing from a user perspective. At the same time it’s a one-off procedure which should only take several minutes to connect to each exchange. You can select each individual exchange from the dropdown menu as shown above to bring up their orderbook and price charts. You can also view pricing information on each exchange in a more summarized format using their ‘Market Cap’ tab. Bitsgap also allows you to use the standard advanced charting tools such as trend lines, Fibonacci retracement lines, Bollinger bands, and the like. Another feature they have added is the comparison tool (the scales icon at the top of the chart), which allows you to compare prices on one exchange with another. To illustrate, the chart below shows the different prices for the DASH/BTC trading pair on Binance compared with Kraken. We won’t be talking much about Bitsgap portfolio management features here, which are pretty standard and allows you to view your holdings by token and exchange. What most traders are probably more interested in are Bitsgap’s arbitrage features, so let’s take a quick look at how that works. 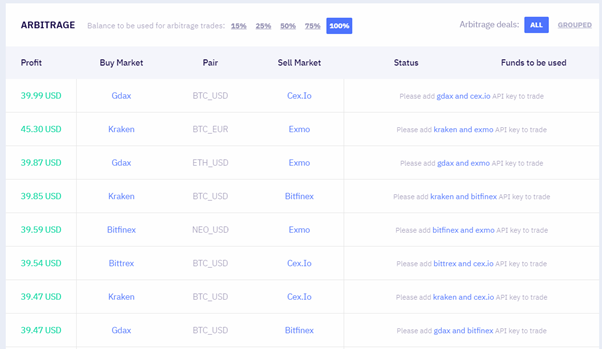 Accessible by clicking on the ‘Arbitrage’ tab, this feature handily compiles a list of potential arbitrage opportunities from all its supported exchange in one easy-to-view format. As long as you have the necessary accounts with those exchanges and have added the API keys on the platform, you should be able to exploit them. While arbitrage opportunities clearly exist in the crypto markets, they are difficult to exploit due to timing and logistical issues. Bitsgap aims to solve this problem by listing as many arbitrage opportunities as possible in a single interface and more importantly, allowing you to make ‘one click’ arbitrage trades. For instance, if I had filled in the relevant API keys and had sufficient funds on the relevant exchanges, there would have been a ‘Trade’ button under each Status column. Do note that trading fees from the respective exchanges are likely not included in the arbitrage profit calculations. Further, due to internal process requirements, maximum arbitrage profit is limited by Bitsgap to USD 50.00 per trade. At present, Bitsgap claims to take no commission or spread on each trade and charges no fee. However, it does mention that in its (very helpful) FAQ that it will soon move to a monthly subscription model. Bitsgap is a valuable tool in case you want to observe all the market quickly from one single interface. Platform is regularly updated and new functions like Stop Loss/ Take Profit, improved Portfolio and other to be added soon. Traders, who would likely have many accounts at many exchanges, would benefit the most from Bitsgap. About Ian Lee — Ian Lee is a freelance writer specializing in the areas of finance and all things crypto. He also has over five years of experience in investment banking. Follow him at http://ianlee.me/. CoinGecko Buzz is a space for lists, guides, and insights article on Bitcoin and other digital currencies (cryptocurrencies).